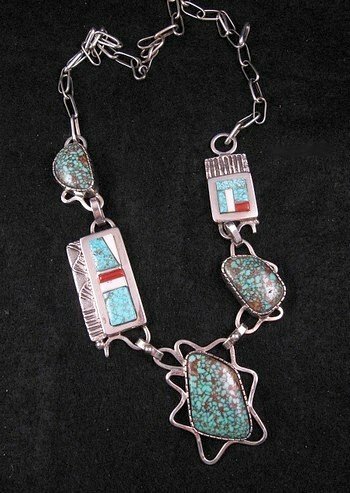 This Contemporary Tufa cast turquoise and inlay silver chain necklace was handmade by award-winning master Navajo silversmith and goldsmith, Erick Begay. Erick calls this piece On My Mind. 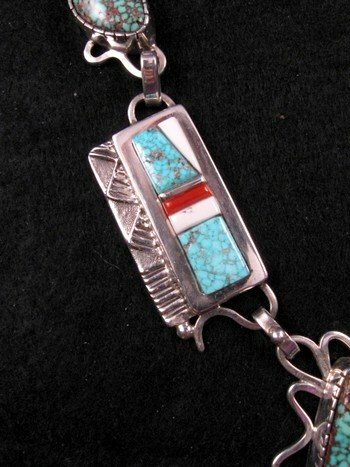 Natural Kingman turquoise, White Buffalo, Coral and Fossilized Ivory was used in this contemporary creation of stone inlay and silver casting. Each pendant and link is handmade with pattern details. The inlay work on this necklace is called corn-row inlay. Tufa-casting is an old Navajo technique where the impression of the jewelry is carved in volcanic stone (tufa-stone) and the molten melted is poured into the impression. Brand new and in perfect condition. Gift Box and Certificate of Authenticity included. Purchased direct and in person from the artist, Erick Begay. 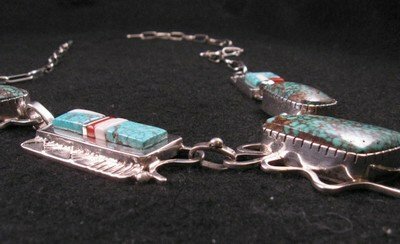 This necklace is a stellar piece of Navajo hand made jewelry. 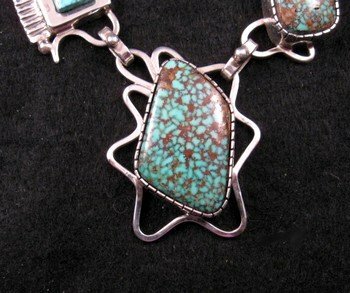 About Erick Begay: Erick Begay is a master silversmith and goldsmith with more than 20 years experience. He is also an award winning artist that has won numerous awards, including 1st Place awards at Santa Fe Indian Market and Eiteljorg Museum Show. His family has been involved in Native American Jewelry for generations. 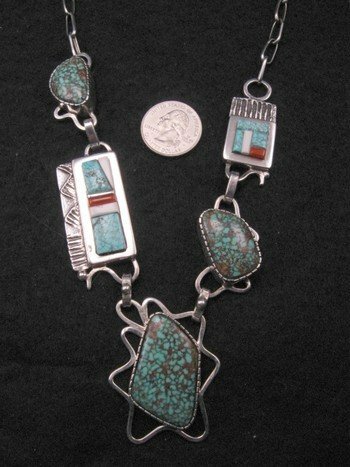 His mother, Frances Begay, taught him the art of silversmithing. Erick started making jewelry when he was very young and when he turned 16 he became a full-time jeweler. In 1993, both Erick and his mother, moved to Las Vegas, Nevada and opened their current store. Erick only uses sterling silver, 14k gold, and top quality gemstones. You can rest assured that his jewelry is 100% quality. His work displays the highest caliber of silversmithing, goldsmithing, tufa stone casting, lost wax casting, sand casting, inlaying and engraving.